Two of the biggest Walking Dead games are finally meeting. For a limited time, Walking Dead: Road to Survival will feature playable characters from Telltale’s The Walking Dead: The Final Season, along with all-new story content, announces developer Scopely. For those unfamiliar with Road to Survival, it’s a strategy RPG set in the Walking Dead universe by Robert Kirkman and written by Jay Bonansinga. Bonansinga is also responsible for several novels based on the Walking Dead universe. 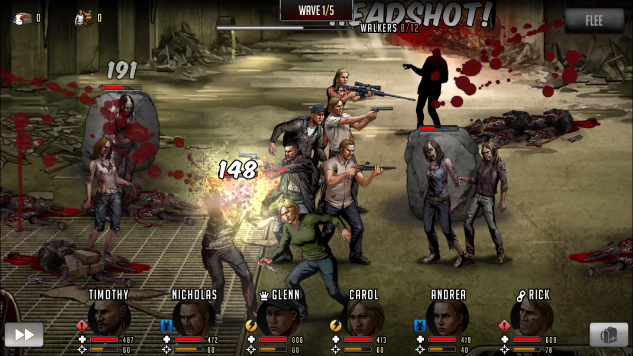 The game sees players choose from a list of classic characters from the comic book, such as Rick and Michonne. Players build and fortify their communities to fight against the threat of walkers, along with other factions seeking to take their resources. In the limited-time crossover event, which runs through mid-August, players will be able to play through never-before-seen storylines (called “Roadmaps” in The Walking Dead: Road to Survival) inspired by the events of The Walking Dead: The Final Season. Three new playable characters from the Telltale Games series will join the fight in The Walking Dead: Road to Survival. Players will also be able to win Telltale-themed rewards by fighting in select in-game tournaments, running from July 17 through mid-August. No word on which characters are making their way from the Telltale games. The game studios have had crossovers before featuring characters from previous seasons of Telltale’s The Walking Dead. Players will have to play the game’s “Roadmaps” mission in order to find out which new characters will be available over the next four weeks. Scopely’s Walking Dead: Road to Survival is available for free on iOS and Android devices, while Telltale’s The Walking Dead: The Final Season will be available on Aug. 14 for the PlayStation 4, PC, and Xbox One.